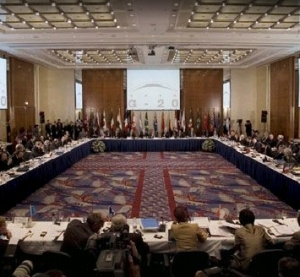 Washington summit: converting G8 into G20? The summit achieved general agreement on how to cooperate in key areas to strengthen economic growth, deal with the financial crisis, and to avoid similar crises in the future. The Group of Twenty Finance Ministers and Central Bank Governors (G20) represents 20 economies: 19 of the world's 25 largest national economies, plus the European Union (EU). The G20 comprises 90% of global gross national product, 80% of world trade (including EU intra-trade) and two-thirds of the world population. Attendees signed a five-page concluding communique and made numerous statements about its importance and landmark decisions. However, the communique will not rewrite the 1944 Bretton Woods agreements that created a system of monetary management and established the rules for commercial and financial relations among the world's major industrial states through the early 1970s. Paris, Berlin, Moscow, Rome, Tokyo and even London are speaking of the need for overhauling the present monetary-financial system. But this will be a lengthy process. There was less than a month to prepare for the G20 summit as opposed to two-and-a-half years to finalize the Bretton Woods system. Moreover, such political giants as then U.S. President Franklin Delano Roosevelt and British Prime Minister Winston Spencer Churchill oversaw the creation of the Bretton Woods system, the World Bank and the International Monetary Fund. Unfortunately, their present-day counterparts, George W. Bush and Gordon Brown, may not be up to the task. Given the above and the fact that U.S. President-Elect Barack Obama will not be inaugurated until January 20, the Washington summit will only serve as the beginning of this process. The second G20 summit could either be held April 30, 2009 in London, after the United Kingdom assumes presidency of the G8 in January, or in Tokyo which is ceding its G8 presidency to London. Though it failed to establish a Bretton Woods II system, and coordinated relatively few financial-banking regulation measures, the Washington summit will be remembered for some no less useful results. Above all, the list of invited heads of state looked rather impressive. This probably implies that the G8 concept will eventually be superseded and a new "Group" chosen to discuss the world's geopolitical and financial-economic policies. This will become obvious, if the current G20 line-up is preserved until the April 2009 London (or Tokyo) summit. Several years ago, Russian President Vladimir Putin started talking about the need to turn the elite G8 club into a more democratic entity involving China, India, Brazil, South Africa and the Republic of Korea. Putin's successor, Dmitry Medvedev, is also making similar statements. Frankly speaking, major changes will take place at the meetings of G7 financial chiefs, rather than during G8 events. Although Russia has been invited more frequently to such meetings lately, it would be an illusion to say that it has played an important role. In addition to the G8 and EU, the G20 summit included Argentina, Australia, Brazil, India, Indonesia, China, Mexico, Saudi Arabia, Turkey, South Africa and the Republic of Korea. However, Washington did not invite these countries to the summit out of remorse for its financial blunders. At first, Paris and London wanted to convene a much smaller conference and to chastise the United States for its freewheeling banking and financial policies. The Bush Administration proposed increasing the number of delegates to 20, presumably to hold a complaining French President Nicolas Sarkozy at bay. Quite possibly, President Bush could be remembered for the landmark G20 summit. At any rate, the G20 has asserted itself. It appears that the G8 will not last long because such entities become redundant after being deprived of specific mechanisms for solving problems. In the last 6-7 years, the G8 has done little to solve global problems, namely, climate change, food, poverty and energy problems, or such regional problems as bloody wars in Sudan and Rwanda and the Middle East conflict. In terms of political implications, the conversion of the G8 into the G20 is a natural process. Nevertheless, the G20's creation should not be seen as a long-awaited cure-all for neglected diseases. Anyone who thinks otherwise might as well believe in the famous philosopher's stone, a legendary substance, supposedly capable of turning tin into gold. The G20 is highly unlikely to quickly fix the world's financial system because financial institutions have long transcended national borders and have become globalized to such an extent that they overtly or covertly contradict the national-sovereignty concept. Such repairs are therefore a mind-boggling task, all the more so as the G20 involves different players who vary in terms of their financial behavior, temper and weight. Although the G7 and the G8 are too small for the modern world, the G20 may prove excessive. Naturally, the G20 will move to draft new guidelines for global financial markets. However, the new regulations are likely to permit wide fluctuations within established boundaries. New vested interests will inevitably emerge within the G20 format. Russia which provides immense raw-materials and energy support for the world economy will only benefit from this process. Moscow will find it easier to choose future partners because, whether some like it or not, oil and gas will remain more influential than other economic variables in the foreseeable future. The G20 could eventually move beyond financial regulation and start solving political problems, too. Unfortunately, it has taken a global financial crisis to convert the elite G8 club into the G20. In his first CBS interview after the November 4 presidential elections, Barack Obama said the current crisis was still dwarfed by the 1929 Great Depression when unemployment affected one-third of the U.S. workforce. International experience implies that major upheavals are the only way to persuade national governments to display common sense. Hopefully, the G20 will have more common sense than the G8.